Surprise! Available on Nyaa (ID# 1044500), I've finished working an R2J-based encode of Photon after being provided with native sources to work with. The old US-based transfer was washed out and compressed by comparison. However, the Japanese footage also required some cleanup for artifacts like oversharpening on-disc and chroma bleed and rainbowing, which I corrected to the best of my ability. I then remuxed in the dub from the R1 release as well as subs which I retimed and then inserted a few errant missing lines and typeset signs to finish things off. Possible improvements would be if I could obtain completely untouched sources (the R2Js I used were re-authored as 2xDVD5s from their original 2xDVD9s format vs. the 1xDVD9 cheaped-out R1 transfer). Also my R1 source is the old (2004) Central Park Media release vs. the recent (2017) Discotek re-release, and while it probably won't be any better image-quality wise, they could have commissioned a newer subtitle translation (I haven't been able to confirm this one way or another), since the old localization honestly isn't the best. 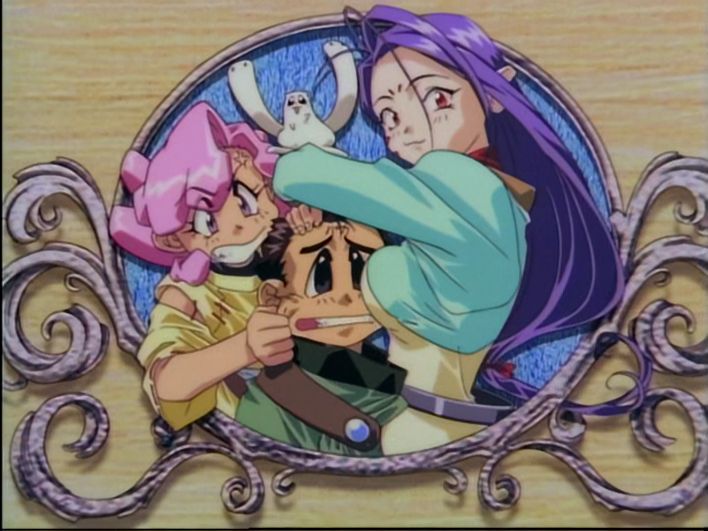 I've also now gotten a hold of native R2J DVD sources for Tenchi Universe & Tenchi in Tokyo so I'm planning to re-do both those series with my own encodes along with R1 sources for Pretty Sammy TV in the near future. However, I'm going to delay starting work on them in the off chance that the recently-announced JP BDs turn out to not just be simple upscales or are better-authored SD footage on BD. P.S. Photon's dub isn't very good except for Papacha and the Galactic Emperor especially.